Exclamation mark appears above the number key 1 on a standard keyboard layout. You can press “Shift + 1” keys to type the exclamation mark. On a mobile keyboard, you may need to press numbers or symbols key and select exclamation mark. On Windows, you can press one of the alt key and type 33 or 0033 using numeric keyboard. Specially on Microsoft Word, type 0021 and press alt and x keys. Press “Win + R” keys to open Run command. Enter charmap and press enter to open Character Map utility. 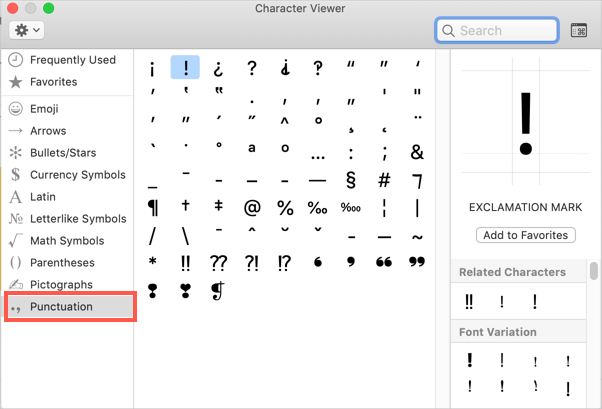 Click on the place inside your document and insert the exclamation mark from Character Map. On Mac, first change the keyboard layout to Unicode Hex Input. Then hold the option key and type 0021 to create exclamation mark. Press “Control + Shift + Command” to open Character Viewer utility. You can open this utility by going to the menu “Edit > Emoji & Symbols” in most of the applications like Pages and Keynote. Go to “Punctuation” group and find all exclamation symbols. Exclamation mark has both entity name and entity string values. You can use any of these on your HTML documents. Type & e x c l; as entity name or use decimal code (& # 3 3;) or hexadecimal code (& # 0 0 2 1;). The browser will interpret these codes to exclamation symbol when you view the HTML page. Below are some of the alternate names for the exclamation mark. People use exclamation mark for various purposes. It includes using as a punctuation mark and using as an operator in programming / scripting languages. In PHP scripting language, A != B indicates A is not equal to B. There are different exclamation symbols available in unicode standard. For example, Alt 8 2 5 2 to type double exclamation mark. If three digit codes are not working then try to use four digits with a leading zero. For example, instead of Alt 1 6 1, use Alt 0 1 6 1. Also, use the HTML shortcuts without any spaces and with ; at the end.